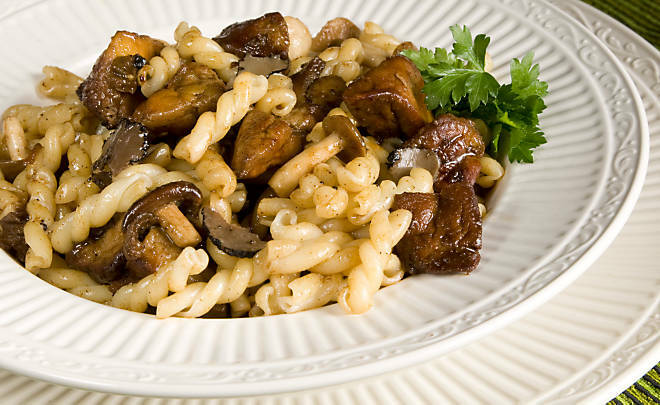 We’re more than just meat … did you know that D’Artagnan is also a purveyor of mushrooms? We follow the seasons around the globe to bring wild mushrooms to our chef clients. The fragrant and delicate truffles and porcinis, morels, chanterelles, mousserons, hedgehogs, matsutakes, chicken of the woods and many more, come by truck and airplane from just about every corner of the globe. Foraged from woods and mountains by experts, then swiftly transported to us, these are the very essence of wild eating. Their seasonal availability, fragile and perishable nature, and their susceptibility to the vagaries of weather make them all the more precious. We also offer beautiful cultivated and wild mushrooms that work in many recipes, such as the ones below. 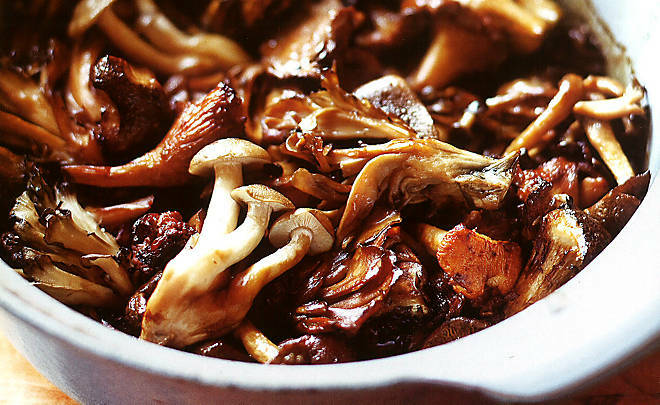 We hope they will inspire you to cook a meal that includes mushrooms. And should you be inclined to explore, or rather, to forage for more, you will find others on our website. 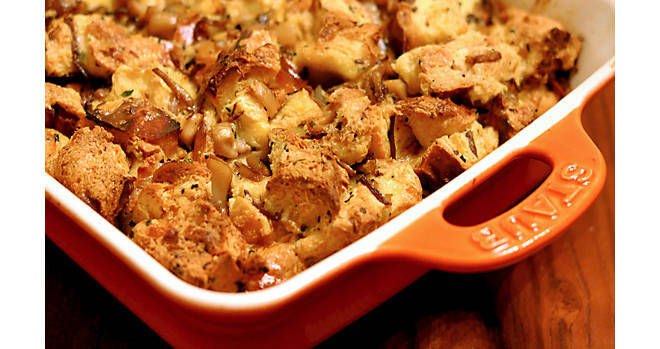 This simple recipe is rich and comforting. And while we think it’s totally fabulous as-is, when you add a generous knob of black truffle butter and serve it on petit toasts, it becomes luxurious party food. 2. Melt the butter in a large skillet over medium-low heat. Add the mushrooms and cook, stirring frequently, for about 20 minutes, or until they have released their liquor and reabsorbed some of it. 3. Meanwhile, split the French rolls, butter them lightly, and toast them lightly under the broiler. Divide the toasted rolls equally between 6 plates (2 small halves or 1 large half on each plate). 4. Add the cream to the mushrooms, stirring it in well, and continue to cook for another 8 to 10 minutes, or until the sauce thickens. Season to taste with salt, then spoon the mushrooms and sauce over the rolls. Garnish with some chopped parsley, if you like. Add a little luxury to weeknight dinner with this simple recipe that uses top-tier ingredients but comes together in minutes. It’s a favorite dish at D’Artagnan, and we’ve served it at many tasting events to great acclaim. 1. Cook pasta in lightly salted water, to al dente. Reserve about 3/4 cup of pasta water, set aside. Drain pasta, rinse with cool water and set aside. 2. Heat a large, dry skillet over high flame. When hot, sauté foie gras until golden brown (about 1 minute), then remove from pan and set aside. Add the mushrooms to the same pan and sauté for 2-3 minutes. 3. Leaving the mushrooms in the pan, add the demi-glace, reserved pasta water and porcini flour, then reduce by a third. 4. Add the cooked pasta to the pan, toss to coat with the liquid, add 2 tablespoons of black truffle butter, allowing it to melt. Now add the sautéed foie gras, and toss it all together gently. 5. Add salt, pepper, and more truffle butter, to taste. 1. Preheat oven to 350 degrees F. Grease a medium sized casserole, about 9×12. 2. Spread brioche cubes in a single layer on a baking sheet. Bake until golden brown, turning once, about 10 minutes. Set aside. 3. In a large skillet over medium heat, melt 1 tablespoon black truffle butter. Add shallots and garlic. Cook, stirring occasionally, until they begin to soften, about 3 minutes. Add mushrooms, season with salt and pepper. Cook, stirring occasionally, until mushroom liquid has evaporated and mushrooms turn golden (about 15 minutes). Stir in thyme, parsley and chives. Cook about 1 minute more, remove from heat. 4. In a large bowl, whisk together cream, milk, eggs, and cheese. Season with salt and pepper. Gently stir in mushroom mixture and bread cubes, turning to coat. Let rest for about 10 minutes, then pour into prepared dish. 5. Bake until slightly firm to the touch, about 30 – 35 minutes. Cool slightly on wire rack, then unmold and serve. This simple recipe from Bruce and Eric Bromberg of Blue Ribbon fame, has few ingredients but is packed with umami. It’s a favorite dish at their New York City restaurant, Blue Ribbon Sushi, and once you see how easy and delicious it is from your own kitchen, we have no doubt it will be one your favorites too! And it takes only ten minutes to make. Broiled Wild Mushrooms with Tamari Butter by the Bromberg Brothers. Photo: Quentin Bacon. 2. In a medium bowl, toss together the mushrooms, tamari and sake. Arrange on a rimmed baking sheet and dot with butter. Broil, turning once, until tender and golden, about 5 minutes total. Next Post October is ….